Who doesn’t love Fried Chicken? I grew up with fried chicken that was cooked in 1″ of oil in the largest iron skillet that you could imagine. It was so good. But as I got older, I realized that amazing fried chicken was not good for me at all. 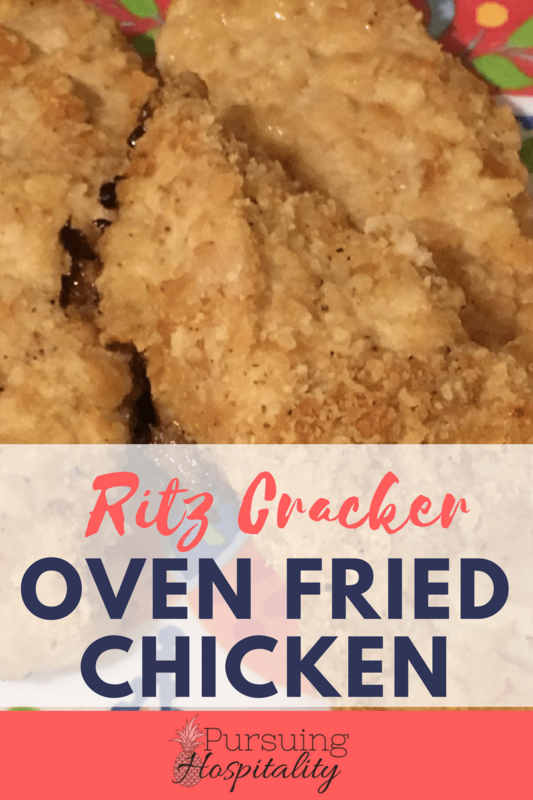 This recipe, Ritz Crackers Oven Fried Chicken has been my go-to recipe to help cut down on the stove top frying. I was very reluctant at first that this would be as good as the fried chicken that I grew up on. I was really amazed at how the Ritz crackers stayed crunchy and also added really great flavor to the chicken. It was a great combination. Who has picky eaters in your house? Put your hands up. It is ok, I have one too! I have a big one… MY HUSBAND. You would think that after 29 plus years of marriage he would have broadened his food base. That is not the case at all. So when I mess with a recipe or a way of cooking it takes him a long time to adjust. Good news!!! He liked this recipe. He liked the fact that the crust was crunchy and it was tender inside. So, try it on even your picky eaters. They might surprise you. I like this recipe as well because you don’t have to have too many ingredients to make a great dish. 7 ingredients are all it takes. Crush your Ritz crackers and mix in your minced garlic, salt & pepper. Put in a bowl that has a large base to where you can coat the chicken easily. You can use your food processor if you would like to crush the crackers. Soak the chicken in the egg for about 5 minutes to make sure your chicken is saturated with the egg. Coat your chicken in the cracker mixture. Place on a cooking spray coated pan. Cut the 1/2 of a stick butter up into small cubes and place on the chicken evenly. Cook for 30 minutes until crispy brown and cooked all the way through. 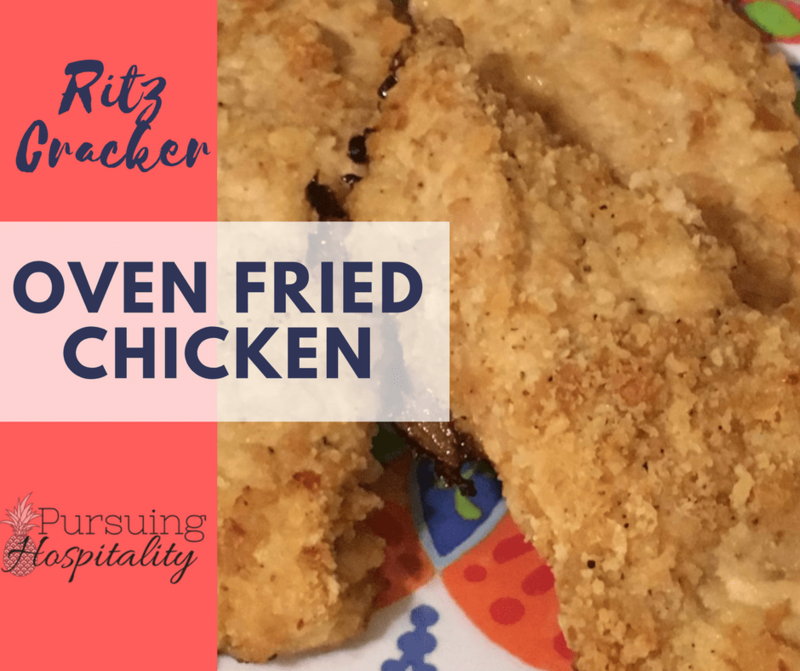 *I ended up turning my chicken over and putting the bottom side of the chicken on broil for a couple of minutes just to get both sides evenly crispy. I usually serve this with microwave potatoes and green beans. Simple and quick. « Why Do We Celebrate Easter?